Description: Wow...You can have it all! Pretty brick 2 story in culdesac with covered front porch on very private .36 acre lot with master retreat down! Huge kitchen with smooth top stove & lots of counters & cabinest that opens to family room with corner brick fireplace! Deck & gorgeous oaks! 8 zone sprinkler system to keep yard lush! Gorgeous wood laminate floors! Crown molding & chair rails! 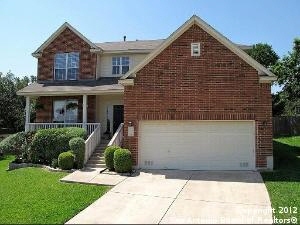 Awesome master w/deep garden tub, walk in shower, his & her sinks & walk in closet! Upstairs loft/2nd living room!